So, hopefully you know by now that there's a little show called Pretty Little Liars: The Perfectionists and if it wasn't obvious already, it's a spinoff of PLL. And one thing that this new series has done, to the extreme appreciation of fans like me, is give updates on all of our fave PLL couples. 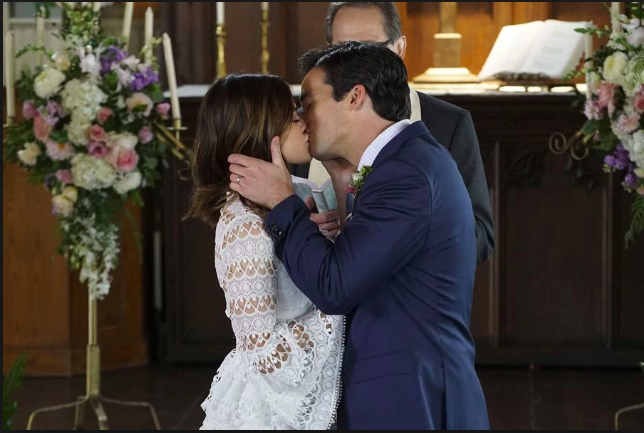 For instance, Aria and Ezra — who got married in the PLL series finale — now have a daughter named Katherine Ella, and Aria's written a best-selling novel that's being made into a movie. Spencer and Toby eloped, and Hannah and Caleb had a baby. As for Alison and Emily, The Perfectionists pilot revealed that their relationship was on the rocks. Alison is in Beacon Heights alone, while Emily is, assumedly, back in Rosewood with their twin daughters. Alison revealed that the two were having trust issues, but that she was "not giving up" on their marriage. Shay Mitchell, who played Emily Fields, has no plans to appear in the new series, so this was kind of expected. But, fans had hope that their fave couple could work it out somehow. Unfortunately, the road has officially come to an end for Emison. On the most recent episode of The Perfectionists, Alison signed divorce papers. So, tragically, this means that our beloved Emison is no more. On the other hand, we'll probably be getting a new love interest for Alison in the coming episodes and I'm kind of excited. How do you feel about Alison and Emily getting divorced? Who would you want to see Alison date on The Perfectionists? Tell us in the comments!